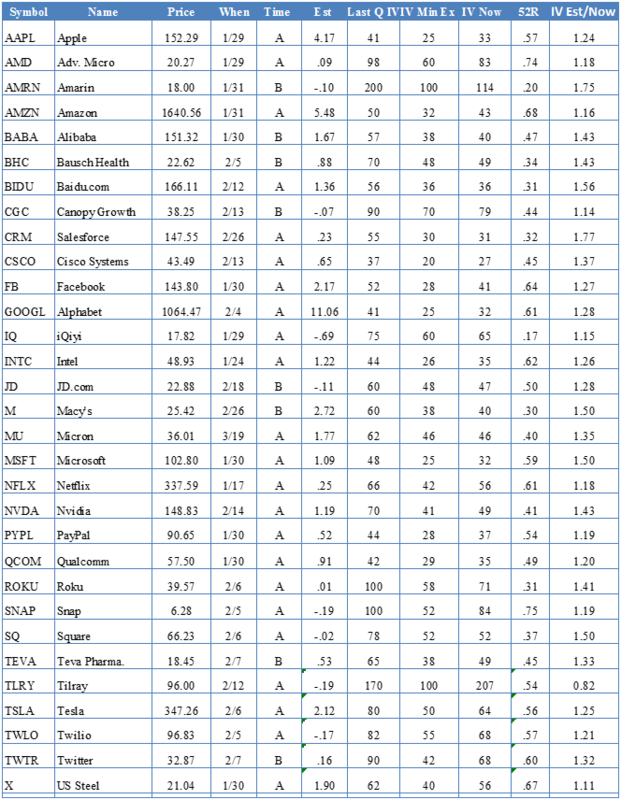 With fourth quarter earnings getting underway, the time has come to update our Volatility Kings ™ list of companies that have a regular tendency to experience increasing option implied volatility as their quarterly reporting dates approach. The degree of uncertainty for upcoming reports may not be comparable to previous quarters. Since implied volatility defined by both the VIX and our Implied Volatility Index Mean (IVXM) recently increased along with options volume, and now slowly declining, changing market volatility also affects many individual stocks. Some companies are on the list one quarter and not the next, while others seem to remain on our list quarter after quarter. Since the focus is on earnings, others with high-implied volatility due to takeover speculation or FDA announcements do not appear along with those lacking sufficient liquidity due to low option volume described as below. Whacking down through the weeds, the process begins by selecting a group of individual stocks all with prices greater than 5, since when prices are too low there are usually not enough option strike prices or liquidity for option strategies. In order to focus on those with the best options volume and liquidity, both the weekly and month average options volume requirement is greater than 20K contracts. For some companies this results in inclusion one quarter but not the next. However, the objective is to find those stocks with sufficient options liquidity and therefore reasonable bid/ask spreads to use for various multiple leg strategies, such as Calendar Spreads, Butterflies, Iron Condors, Straddles and others. The volume search begins at the “Top 200 stocks by volume / open interest” link on the left side of the “Rankers and Scanner” section about two-thirds of the way down our home page where we feature a complimentary ranker sample of the top 200 stocks and ETFs by Options volume and Options open interest, displaying weekly averages. Then the Implied Volatility differential from last quarters’ earnings announcement high to the subsequent after reporting low needs to be greater than 10%, occurring regularly with some flexibility on the regularly occurring requirement as it may vary due to changing market volatility or company specific events. Price in column 3, are closing stock prices as of January 11, 2019. When in column 4 is the next expected earnings report date. They require checking often as these are only estimates and companies routinely change the dates. Time in column 5 is the time during the day to expect the report, where B is before the open, A is after close. Est or Estimate in column 6 is the current consensus earnings estimate per share, also subject to change before the report date. Some may also have higher “whisper” estimates. In addition, stock prices move on forward guidance as much, or perhaps more than on reported revenues and earnings, especially guidance for the first quarter 2019. Last Q IV in column 7 is the Implied Volatility Index Mean (IVXM) of the puts and calls reached just before the last quarterly report, but may not necessarily be very relevant this quarter. IV Min Ex in column 8 shows the Implied Volatility Index Mean (IVXM) low after the last earnings report, making it easier to compare the pre-report high to the subsequent after reporting low. IV Now in column 9 is the Implied Volatility Index Mean, (IVXM) as of January 11, 2019, after the VIX had declined to 18.19 and the IVXM was 15.59 and the day-weighted futures premium finally turned positive at 6.71%. Depending upon the last report date the implied volatility of some may still be declining from their recent report such as Micron (MU). 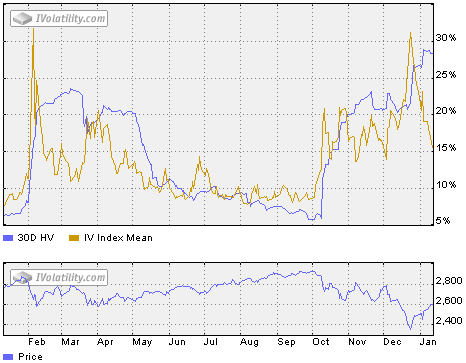 52R, displays the current Implied Volatility Index Mean (IVXM) relative to the 52-week range. Where .74 is near the 52-week high for Advanced Micro (AMD) and .17 for iQiyi (IQ) near the bottom of its 52-week range. IV Est/Now in column 11 is the ratio of the estimated implied volatility to the current implied volatility based primarily on the high reached the previous quarter. Those with higher ratios have a potentially greater opportunity to increase going into their next report date such as Amarin (AMRN) with a ratio of 1.75 while those with lower ratios may have already started increasing anticipating the next report or may be distorted by recent speculative activity such as Tilray (TLRY) with a ratio of .82, since the implied volatility of many have advanced due to the market decline at year-end, reducing the ratios. This Roku (ROKU) chart from our Advanced Historical Data service illustrates the pattern of regular quarterly changing implied before and after reporting. The previous reporting dates are marked with arrows. 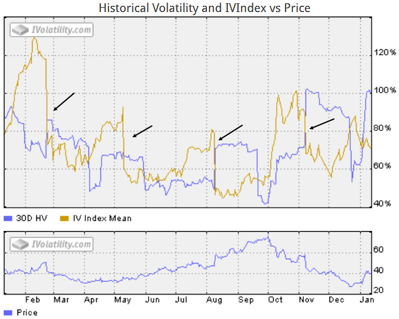 Notice how the orange IV Index Mean volatility drops on the report date. When the stock also makes a large move the blue 30D HV (Historical Volatility) quickly advances as shown for the last August and November reports. The typical pattern is for implied volatility to decline for 4-6 weeks after the reporting date followed by a subsequent rise for about 3-4 weeks before the next report, but vary with each having its own somewhat unique pattern. The market implied volatility also plays a role. The S&P 500 Index implied volatility, measured by our IVolatility Implied Volatility Index Mean (IVXM) using four at-the-money options for each expiration period along with our proprietary technique that includes the delta and vega of each option, declined 3.48 points or -18.25% last week closing at 15.59 vs.19.07 for the week ending January 4. This volatility chart with its corresponding S&P 500 Index line chart below reflects the recent declining implied volatility and S&P 500 Index bounce up from the year-end lows. To help identify implied volatility highs, lows, and forecast where they may go, along with other details, make sure to check the volatility charts at either our complimentary Basic Options or our more detailed Advanced Historical Data pages on our website. Frequently calendar spreads, also called time spreads are used for quarterly reporting by selling the near term option with higher implied volatility and buying the same strike price in the deferred month with a lower implied volatility. However, since this position will have short gamma or the rate of change of delta, any large move of the underlying stock on the report date will result in a loss. For example, those with IV/HV (implied volatility/historical volatility ) ratios greater than 2.00 using the range method for historical volatility, imply large moves. With many indexes and stocks moving 1% or more recently, short gamma long calendar spreads are trouble. The alternative approach, distinguished by the expiration date of the short option relative to the earnings report date has quite different characteristics. When the short option expires before the report date, the short option implied volatility is less likely to advance while the implied volatility of the deferred long option, expiring after the report is more likely to advance into the earnings report. In addition, the risk of a harmful stock price gap diminishes by closing the spread before the earnings report release. This strategy depends on closing the position one or two days before the short option expires and is thus, truly a time spread designed to capture time decay of the short front option relative to the long option while any implied volatility advance of the deferred option is a bonus. Option prices continuously change in response to changing expectations. The higher the uncertainty the more valuable the option, implying there is a much wider distribution of possible outcomes. When they become more predictable, the implied volatilities no longer increase dramatically before the reporting dates, option volume usually declines and they disappear from Volatility Kings™ while others take their place. Individual investors relying upon the earnings forecasts and playing the expectations game wondering if they may be too high or too low are disadvantaged when anticipating the direction the stock will move after reporting. However, if the implied volatility has risen enough into the report date it may offer an opportunity for a volatility strategy and not rely upon getting the direction right. In addition, since earnings reports reoccur every quarter there may be more than one opportunity, especially the "reliable" ones that have a regular pattern of rising into the report dates. Next week will again feature our market review and report on the progress of the S&P 500 Index near resistance at 2600.